조선후기 함경도(咸鏡道) 지역의 군현 지도를 모은 지도첩으로, 채색필사본이다. 18세기 영조(英祖) 연간에 비변사(備邊司)에서 제작한 것으로 추정되며, 눈금이 있는 방안지(方眼紙)에 지도가 그려져 있다. 본 지도첩은 5책으로 구성되어 있는데, 제1~4책에는 함경도 내 18개 부(府)·군(郡)·현(縣)의 지도가 실려 있는데, 갑산·단천·북청·삼수·이성 등 5개 군현의 지도는 빠져 있다. 제5책에는「함경도지도」·「함경북도지도」·「함경남도지도」가 수록되어 있다. 또, 제5책의 뒷부분에 ‘비변사(備邊司)’라는 도장이 찍혀 있어서 이 지도가 비변사에서 소장·사용하던 것이었음을 알 수 있다. 지도에는 산성(山城)·창보(倉堡)·봉수(烽燧) 및 해로(海路)의 거리 등이 표시되어 있고, 또 여백에 읍성(邑城)·민호(民戶)·군향(軍餉)·성군(城軍)·역참(驛站)·마필(馬匹) 등이 기록되어 있는데, 이는 본 지도첩이 행정·군사적인 목적을 위해 만들어진 것임을 잘 보여준다. 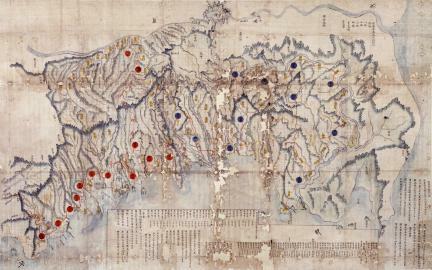 This mid-18th century map albums comprises three general maps of Hamgyeong-do Province and 18 maps of counties and prefectures (gun and hyeon in Korean) in the province. Gapsan, Dancheon, Bukcheong, Samsu and Iseong are not included. All the five albums bear the seal of the Border Defense Council, indicating they were kept and used by the Joseon government agency responsible for frontline security. These maps differ from other Joseon maps stamped with the Border Defense Council seal that are housed at Seoul National University’s Kyujanggak Institute for Korean Studies in that the roads are marked with curved lines rather than straight lines. They are also distinguished in terms of paper quality. These maps were made by the Border Defense Council for regional administrative and military purposes and have high historical and academic value.